Sign up and verify your email address. Create your account for free, and verify your registered email address to keep yourself up-to-date with the marketplace and to be notified for latest projects, contests, and features. Also choose a unique username. It will be your unique ID on Freelancer.com. This cannot be changed once set. Complete your account details. Provide your full name and address. Your first name and the initial of your last name will be your public display name on the site. Also make sure that your account’s country of registration is correct so we can notify you for available projects within your locale. Update your Language Settings as well. Complete your profile details. Upload a professional profile picture, and add a profile headline. Highlight your skills and experience in your summary, and don’t forget to input your hourly rate. Add skills to your profile. You can only bid on a project if you have at least one of the skills required for it, so add relevant skills to your profile so you can start bidding on projects that match your expertise. We offer five paid membership plans for you to choose from for added features and benefits. All freelancers are automatically subscribed to a free account upon sign up. You can subscribe to any of our paid membership plans to unlock the different features and benefits you can use in successful freelancing on the site. All of these paid memberships offer more bids and allow you to add more skills to your profile, which both boost your chances of working on more projects on the site. 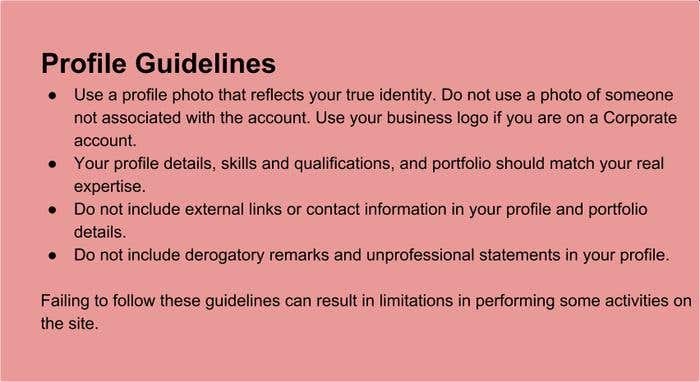 Your profile is your storefront as it gives employers insights about you and the quality of your work. First impressions are everything, and successful profiles are always polished to perfection. Make sure yours is too. It should be a clear portrait photo of yourself, from the shoulder up. Resolution should be at least 280x280 pixels. File size should be up to 2MB. It should indicate your profession / field. It can include your trade / brand name. Keep it short and professional. Emphasize your skills and experience. Be specific (if you have a niche market/technology). Accurately represent your abilities and/or resources. Observe proper grammar and acceptable formatting. You can write up to a maximum of 1000 characters. Indicate your hourly rate, and be hired directly for hourly projects. Add your past work samples and studies. Quality is preferred over quantity. You may ask permission from your past clients. Add your education details, and include employment history. Maximize the allowed number of skills you can add, but only add the skills you have the expertise on. Highlight licenses and special awards/recognition you’ve received. Take Skills Tests to certify your expertise. All passing exam scores will be included here. Verify your email address, phone number, and payment method. Link external accounts (LinkedIn and Facebook) to improve your Trust Score.